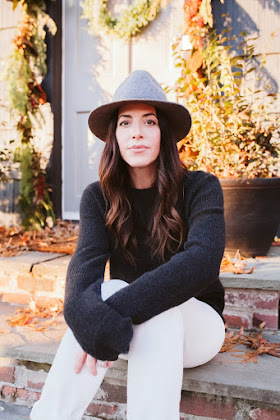 I may be late to the trend....per usual, but maybe you are just hearing about it too? 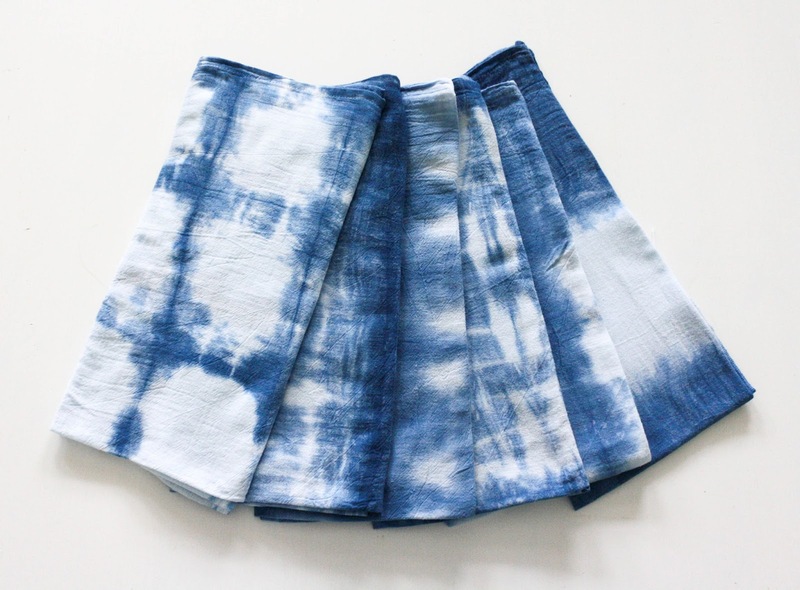 I'm talking about Shibori Indigo dyeing and I'm sort of crazy about it. If you have been following my Instagram recently, you may have seen how I just scored some amazing Hmong Indigo fabric from Thailand that I made pillow covers out of. 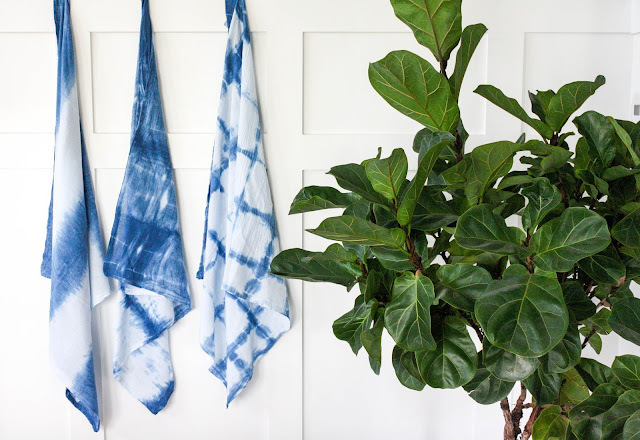 I really love the pop of Indigo in here and so I'm in the process of experimenting with different ways to incorporate it through out our home. My idea was these amazing tea towels that keep popping up everywhere!! Shibori is actually a Japanese technique that involves twisting, bunching or tying fabric along with using wood blocks and rubber bands to create patterns and dyeing it with Indigo dye. The possibilities of design pattern's are endless. 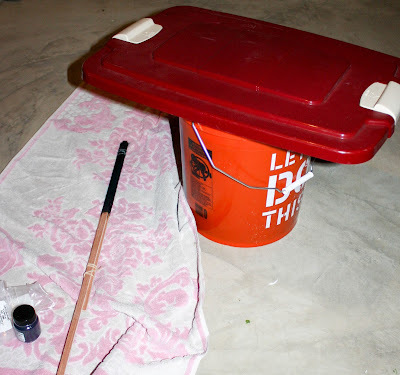 I used this tutorial HERE as a guide along with the instructions on my dye kit. 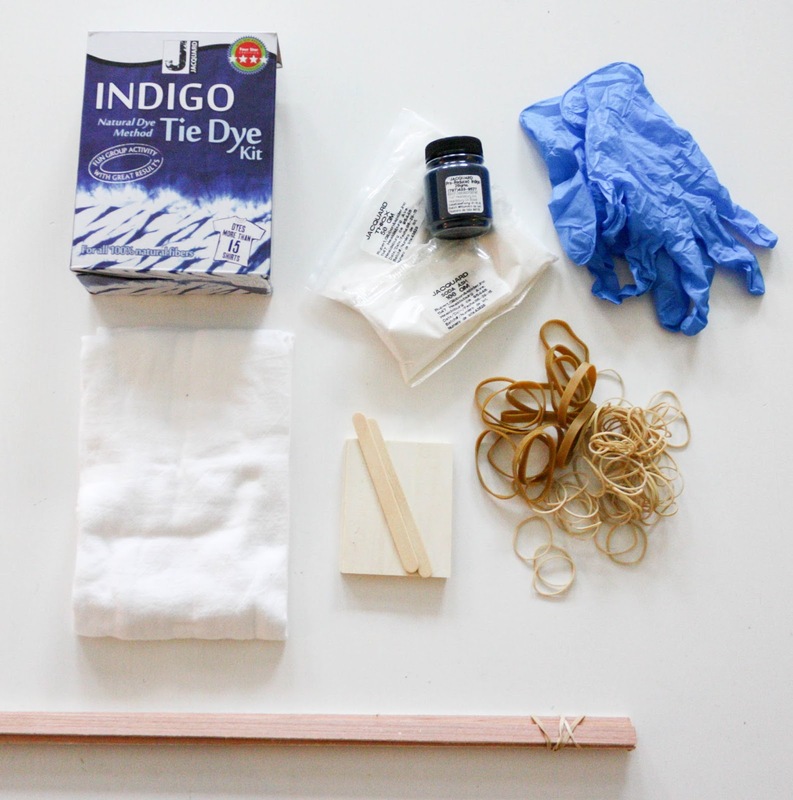 I purchased the dye kit HERE and I also used two pieces of scrap wood tied together with rubber bands as my stir stick...I had to get creative since I needed a long one and didn't have anything else on hand. 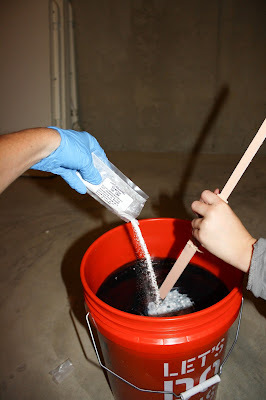 Reading the dye kit instructions beforehand, I knew that I needed a 5 gallon bucket for the process...now I will say, I could of used half the amount of the kit but live and learn...so next time I will only use half of the ingredients at one time and save the rest, since I really didn't need 4 gallons of dye! 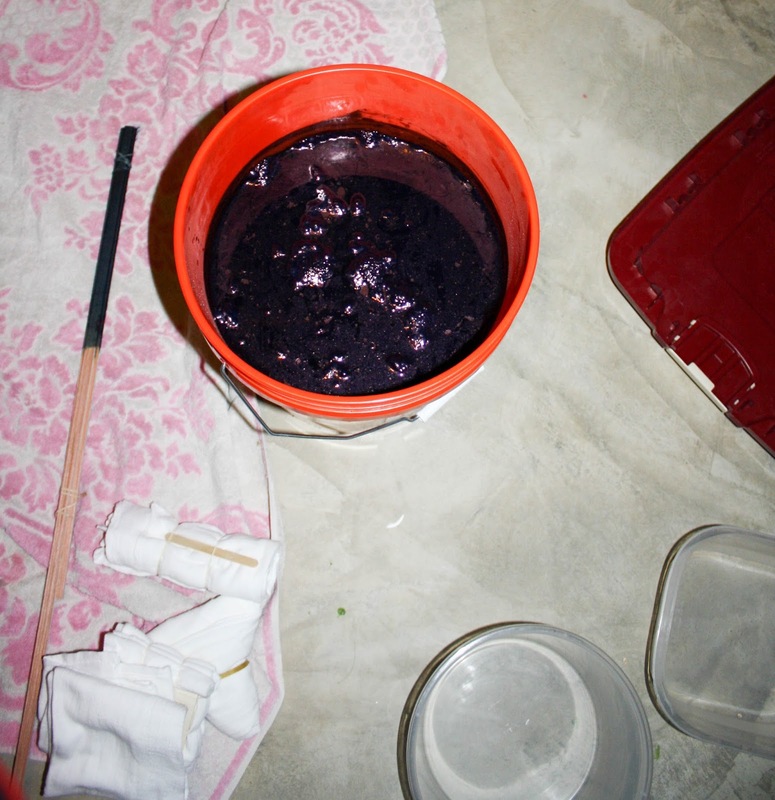 Down to the basement I went.....Here we are mixing the Indigo dye and other ingredients. The key here is to not splash around the mixture but stirring slowly to keep as little oxygen as you can from entering the vat. After mixing, I covered the vat of dye for 1 hour. 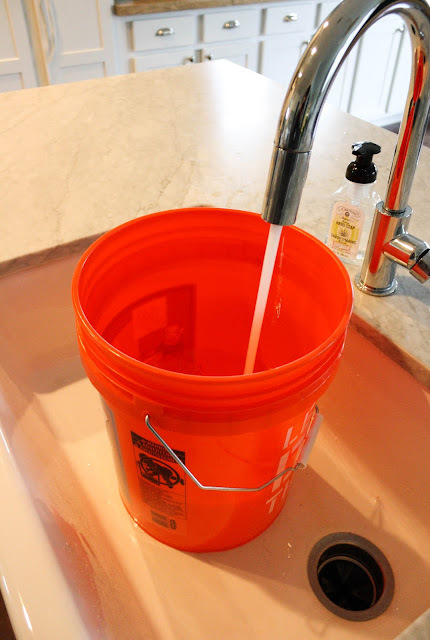 Again, even after reading the directions through ahead of the time, I did miss the fact that I needed a bucket with a lid so this was my solution...not pretty but functional. One hour later and here is my dye. You can't tell in the photo but the dye will appear a dark green or greenish yellow in color. You have to take the 'flower' off the top before you begin to dye. This is the collection of residue that sits at the top. I scooped it out with a plastic dish and set it aside. You also need a clean bucket of water to rinse your fabric in after you have allowed it to oxidize. I still have my vat sitting in my basement because if you keep it covered the kit says it will last several days....I will have to update you on how I dispose of it. After I let my tea towels dry on a rack all night, I washed and dried them to keep them from bleeding. This is definitely one of those DIY projects I can see myself doing from now on. I've been thinking about everything else I can dye with this technique. It's messy if you're not super careful but so easy and the results are quick! That's my kind of project! I've already decided that this is going to be one of my favorite gifts to give out this holiday season...so if you know me, don't be surprised when these end up under your tree this year! I also think they would make beautiful house warming gifts! 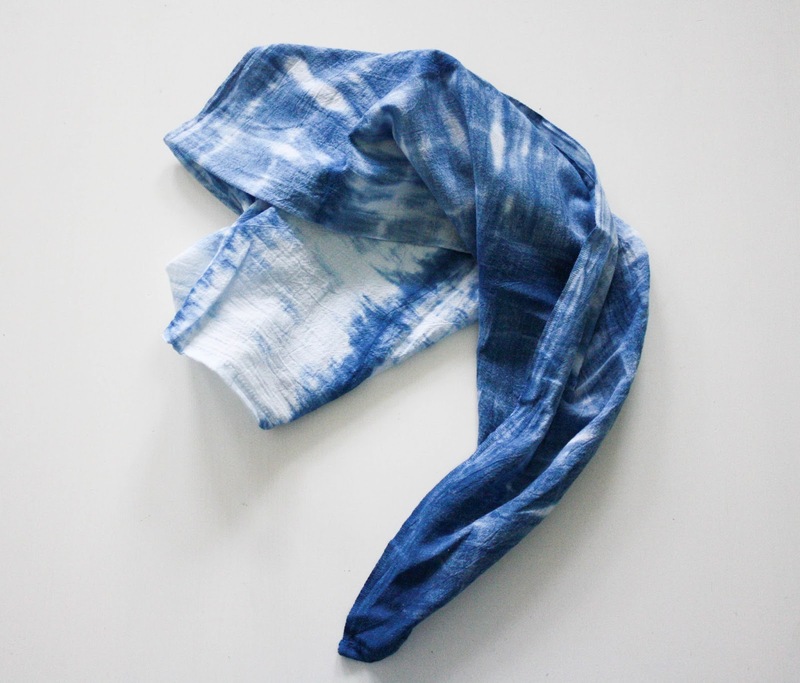 Oh and I do have quite a lot of friends having babies right now....Shibori Indigo baby jammies maybe? 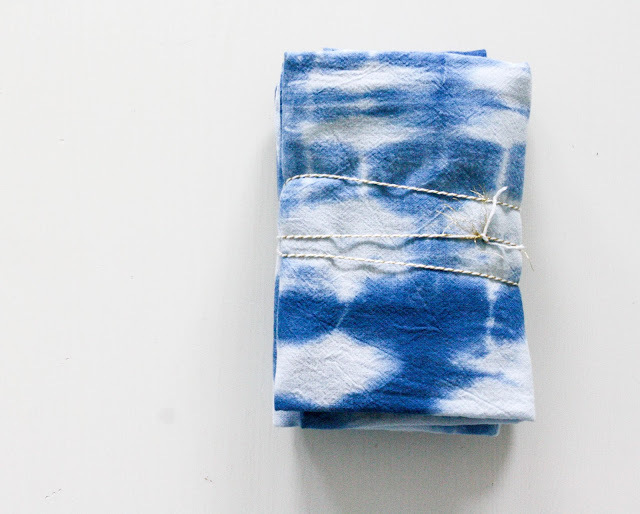 5 comments on "DIY Shibori Indigo Tea Towels "
Such a cute and easy DIY project.....love it! I love these!! I have blue Willow ware plates in my kitchen and these would look fabulous with them. 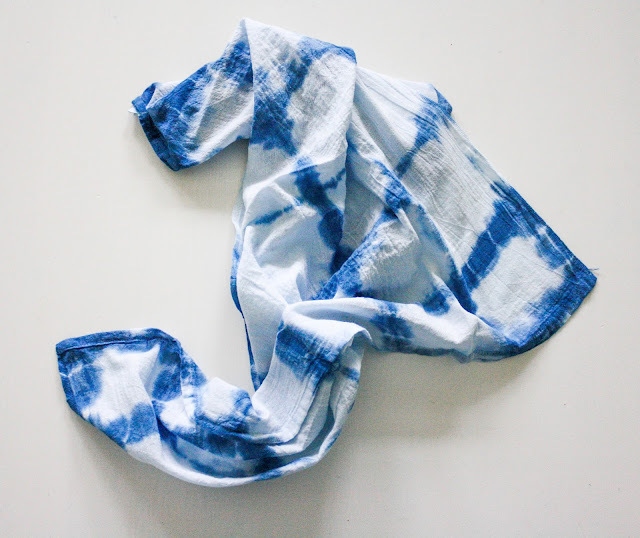 How did you fold/bunch the fabric?